Brother Keychain for big brother, little brother, step brother, new brother, brother in law as wedding gifts, birthday gifts, graduation gifts. 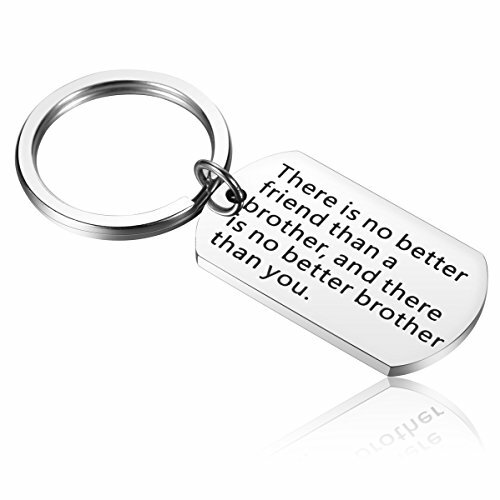 Best Brother Keychain - There is No Better Friend Than a Brother, and There is No Better Brother Than You. Eco-friendly & Safe Material - Made of stainless steel which is recyclable materials, this skin-friendly keychain is lead-free & nickle-free, no harm to health. Free Beautiful Gift Box & Jewelry Pouch - Comes in a gift box for easy gift-giving. After-sales Service - We offer 12 month free exchange for broken, faded items, If your brother keychain come broken or wear out within 12 month, just contact us to get a new one. If you have any questions about this product by Alxeani, contact us by completing and submitting the form below. If you are looking for a specif part number, please include it with your message.